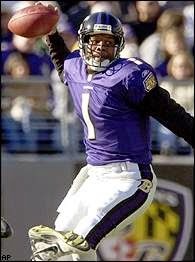 The NFL’s defending champions, the Baltimore Ravens, were struggling at 3-3 as they hosted the Jacksonville Jaguars on October 28, 2001. Coached by Brian Billick, the Ravens had ridden a stifling defense through the 2000 postseason to a Super Bowl triumph, and that defense was still largely in place. However, the offense was another story. QB Elvis Grbac had been signed away from the Chiefs, was not proving to be the upgrade at the position that he was expected to be, and now was out with an injury. RB Jamal Lewis, outstanding as a rookie during the championship season, went down for the year in training camp with a knee injury and his replacement, veteran Terry Allen, was on the downside of his career and was now also injured. 38-year-old Randall Cunningham (pictured above) was starting at quarterback and inexperienced Jason Brookins was subbing at running back for Allen against the Jaguars. Cunningham, whose greatest seasons had come with the Eagles and Vikings, had been an All-Pro as recently as 1998 but was nearing the end of his career. No longer the potent running threat with the big arm that he had been in Philadelphia, he spent the 2000 season with Dallas and was signed to provide a veteran backup to Grbac. Jacksonville, under Head Coach Tom Coughlin, was 2-3 and also experiencing problems, having won its first two games before dropping three straight. The Jaguars also were missing a key player in RB Fred Taylor, who was nagged by injuries, but still had an established nucleus in QB Mark Brunell and wide receivers Jimmy Smith and Keenan McCardell. There were 69,439 fans in attendance at PSINet Stadium. WR Damon Gibson returned the opening kickoff 35 yards to give the Jaguars good starting field position at their own 47 and they advanced deep into Baltimore territory. Mark Brunell completed four passes, three of them to Keenan McCardell, and Jacksonville was also helped by a pass interference penalty. But facing fourth-and-one at the eight yard line, Brunell’s pass intended for Jimmy Smith was incomplete and the visitors came up empty. The teams traded punts before the Ravens, starting at their own 10, began to move on offense. Randall Cunningham threw to TE Shannon Sharpe for a gain of 30 yards to start the drive and hit on three more passes, two to WR Qadray Ismail. However, a holding penalty and a sack blunted progress and on the first play of the second quarter Matt Stover kicked a 49-yard field goal. A long return on the ensuing kickoff was nullified by a holding penalty and the Jaguars started at their 18, but, with the help of the mobile Brunell’s passes and a 38-yard run, they managed to advance into Baltimore territory. The series stalled and Mike Hollis booted a 40-yard field goal to knot the score at 3-3. The teams again traded punts. Regaining possession with just over three minutes remaining in the first half, the Ravens moved from their own 16 to the Jacksonville 35 as Cunningham completed seven passes, the longest to Sharpe for 16 yards, but a sack by LB Kevin Hardy put them in a hole they couldn’t dig out of and they punted. The score remained unchanged at halftime. The Ravens took the second half kickoff and drove from their 32 to the Jacksonville seven. Cunningham connected with Ismail for 20 yards and Jason Brookins had a 23-yard run along the way. But facing third-and-four, RB Moe Williams was dropped for a three-yard loss and the Ravens settled for a Stover field goal from 28 yards. On Jacksonville’s next possession, Brunell completed consecutive passes to Smith for 19 and 11 yards, but two plays later McCardell fumbled after making a reception and DE Rob Burnett recovered for the Ravens at the Baltimore 44. With Brookins running four times for 21 yards, the home team advanced into Jacksonville territory, but facing third down at the 31, Cunningham was sacked for an eight-yard loss by DT Gary Walker and the Ravens had to punt. Starting back at their ten, the Jaguars drove 90 yards in eight plays. Brunell (pictured above) had completions to McCardell for 12 and 13 yards and a roughing-the-passer penalty erased a second-and-15 situation. Brunell ran the ball himself for 17 yards and threw to Smith for a 35-yard touchdown. Hollis added the extra point and Jacksonville was ahead by 10-6. In the last minute of the third quarter, a Cunningham pass was intercepted by LB Hardy Nickerson. Brunell threw to McCardell for 34 yards and, on the first play of the final period, hit RB Stacey Mack for an 11-yard TD. Hollis converted and now the visitors were up by eleven points at 17-6. Cunningham completed four passes on the next Baltimore series, the longest to Ismail for 19 yards, and the nine-play, 71-yard possession ended with Brookins running two yards for a touchdown. The Ravens tried for a two-point conversion, but Cunningham’s pass intended for WR Brandon Stokley was incomplete and the margin remained five points at 17-12. A short series by the Jaguars resulted in a punt and Baltimore put together another scoring series of 56 yards in seven plays. A face mask penalty helped the drive along and Cunningham completed a pass to Sharpe for 13 yards in a third-and-three situation to reach the Jacksonville nine. Following two carries by Brookins that picked up seven yards, Cunningham threw to Ismail for a two-yard touchdown that was upheld upon review by the officials. Once again, the try for two points failed but the Ravens held a one-point lead with four minutes to play. In response, the Jaguars moved methodically down the field as Brunell completed five straight passes, two to McCardell and one for 15 yards to WR Sean Dawkins that converted a third down. But facing third-and-five at the Baltimore 44, Brunell tossed two incomplete passes to turn the ball over on downs. The Ravens were able to run the clock down before punting and, taking over with 19 seconds left, Jacksonville was unable to move from its 42 yard line. The Ravens held on for an 18-17 win. The Jaguars had more total yards (365 to 305) while Baltimore led in first downs (23 to 19) and time of possession (33:44 to 26:16). Each team turned the ball over once. Jacksonville recorded five sacks, to three by the Ravens, but also was assessed 10 penalties, at a cost of 70 yards, to four flags thrown on Baltimore. Randall Cunningham completed 23 of 31 passes for 222 yards and a touchdown with one interception, and crucially was seven-for-seven and 76 yards in the fourth quarter. Jason Brookins rushed for 82 yards on 19 carries that included a TD. 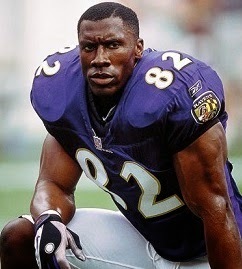 Shannon Sharpe (pictured below) and Qadray Ismail each had 7 catches, for 89 and 85 yards, respectively, and Ismail scored a touchdown. 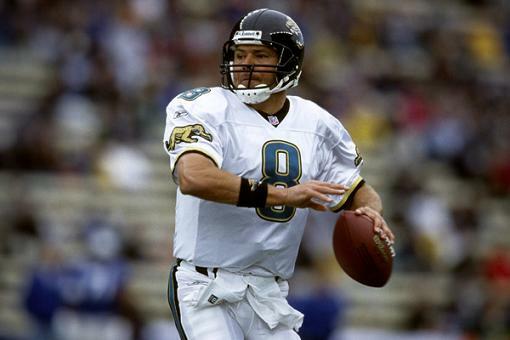 For the Jaguars, Mark Brunell was successful on 25 of 37 throws for 306 yards and two TDs and had no interceptions, also rushing for 55 yards on four carries, which made him the team’s leading ground gainer. Keenan McCardell caught 10 passes for 118 yards and Jimmy Smith gained 119 yards on his 7 receptions that included a score. Baltimore ended up finishing second in the AFC Central with a 10-6 record and once again qualified for the playoffs as a Wild Card entry. The postseason run didn’t go as far as in 2000, as after beating Miami in the Wild Card round, the Ravens lost to the Steelers at the Divisional level. The Jaguars won only one of their next five games but rallied to win three straight and closed out with a 6-10 record that placed fifth in the division. Cunningham did indeed play again the next week, which was another win for the Ravens. Overall, he appeared in six games in 2001 and completed 60.7 percent of his 89 passes for 573 yards and three touchdowns against two interceptions.